We present a case of a 38-year-old female with a history of right posterior ankle pain for 2 months which worsened with walking and standing up for a long time. There were no complaints in other joints. On physical examination the patient presented swelling of the posterior ankle and complained of pain with forced flexion of the right feet. There was no increase of inflammation parameters in blood tests. Radiographic lateral view of the right ankle demonstrated an enlarged Stieda's process (Fig. 1). The magnetic resonance imaging (MRI) of the right ankle confirmed the Stieda's process (Fig. 1) being able to originate posterior conflict, with a subtle bone marrow edema. A slight effusion was observed in the anterior and posterior compartments of the tibiotalar joint as well as edema of the subcutaneous fat. The patient was told to rest and NSAID were prescribed with resolution of the hindfoot pain. 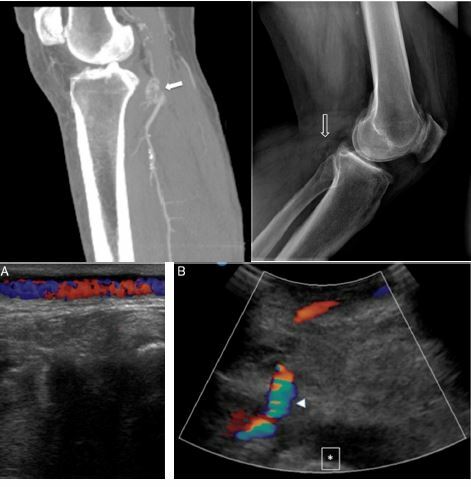 Lateral right ankle radiography (A), T1 weighted sequence (B) and sagittal STIR MRI sequence (C) images demonstrating an enlarged Stieda's process (arrows) with mild bone marrow and soft tissues edema. This case emphasizes the importance of considering posterior ankle impingement due to a Stieda's process of the talus as a cause of hindfoot pain. In fact, it is an underrecognized cause of posterior ankle pain but imaging can easily make the diagnosis and guide appropriate treatment. Soft-tissue and osseous impingement syndrome of the ankle: role of imaging in diagnosis and management. K.A. Peace, J.C. Hillier, A. Hulme, J.C. Healy. MRI features of posterior ankle impingement syndrome in ballet dancers: a review of 25 cases. N.J. Bureau, E. Cardinal, R. Hobden, B. Aubin. Posterior ankle impingement syndrome: MR imaging findings in seven patients. C.J. Wakeley, D.P. Johnson, I. Watt. C.M.A.O. Lima, S.B. Ribeiro, E.P.D. Coutinho, E.M. Vianna, R.C. Domingues, A.C.C. Júnior. Magnetic resonance imaging of ankle impingement syndrome: iconographic essay. T. Soler, R. Jezerskyte Banfi, L. Katsmen. The conservative treatment of posterior ankle impingement syndrome in professional ballet dancers: a literature review and experts consensus. E. Verhagen, A. van der Beek, J. Twisk, L. Bouter, R. Bahr, W. van Mechelen. P. Luk, D. Thordarson, T. Charlton.